On the left map, we grouped Hunting Trips that are located close to each other into small circles. Now, you can locate all Hunting Trips on the map at the same time. You can also drag & zoom the map. Circle numbers - Count of Hunting Trips that are located in and around that circle. 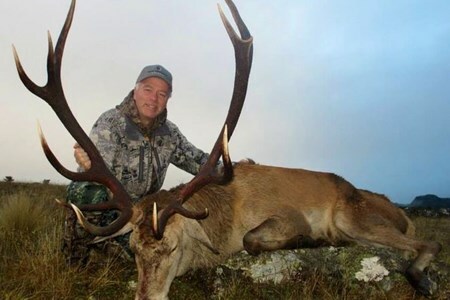 Colored circles - Hunting Trips that are displayed in the list below. Grey circles - Hunting Trips that are displayed on next page(s). Half colored circles - Some Hunting Trips in that circle appear in the list below and some on next page(s). Click on circles to zoom in or highlight Hunting Trips . Hunting with Master Maine Guide and Champion Brittany Spaniel. We’ll provide you with map assistance to aid you in your hunt for birds. 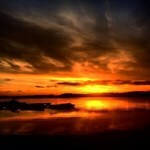 Lakeside lodging and assistance is also provided ... morestarting at $40 a night per person based on double occupancy. Guided hunting trip with Master Maine Guide and Champion Brittany Spaniel. 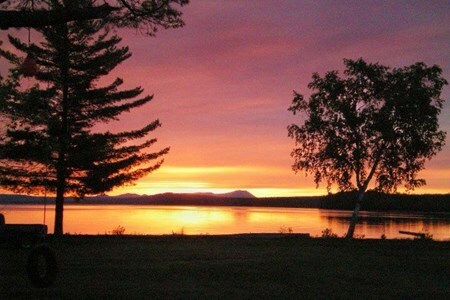 Includes map assistance and lakefront lodging, plus 3 home cooked meals a day. Rates start at $75 per night ... moreper person based on double occupancy. 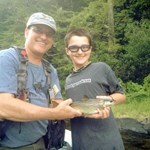 Complete guided fly fishing service and lodging with Master Maine Hunting Guide Brittany Spaniel. 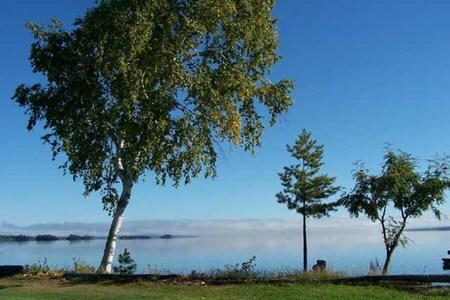 Includes 4-WD transportation, lakeside lodging and meals. $185/day per person based ... moreon double occupancy. You are not left on your own! We provide you with map assistance and daily advice to assist you on your trophy deer hunt. 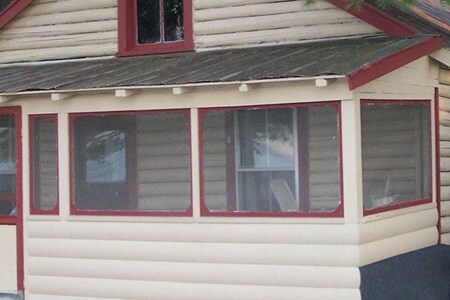 Includes lakefront lodging and extensive pre-season scouting. ... morePrices start at $35/night or $185/week/person based on double occupancy. 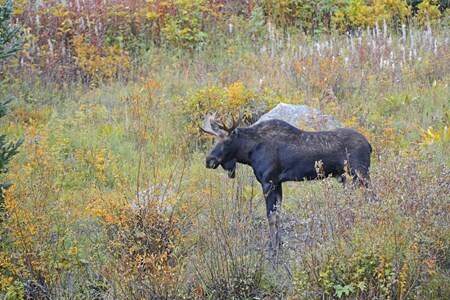 Trophy deer hunting at Moosehead Lake in Maine. 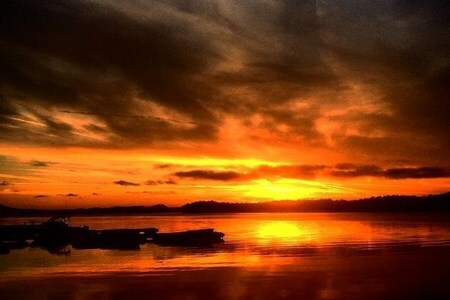 Includes map assistance, lakeside lodging, and meals. Prices start at $70/night or $395/week/person based on double occupancy. 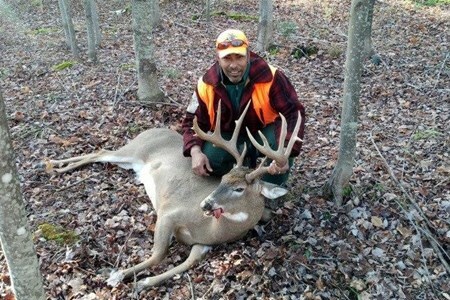 An experienced Master Maine Guide accompanies you on your trophy deer hunt. Includes 4-WD transportation, extensive pre-season scouting, meals and lakeside lodging. We recommend hunters ... morenew to our region choose this guided package. $795/week/person based on double occupancy. 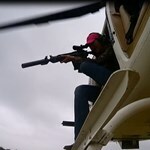 Enjoy the amazing thrill of hunting from the air. We'll take you up in our rock solid Bell Jet Ranger and let you experience the adventure of hunting from the mobile, 44" back seat. ... moreEach trip comes with a professional pilot and safety instructions along with optional Fire Arm Rental and Ammunition for additional fees. Hunters that try it for the first time say it's the greatest thing they've ever done. If you have more than 3 in your party, we can rotate throughout the hunt to accomodate any number. A minimum of 1.5 hours is required for larger parties. 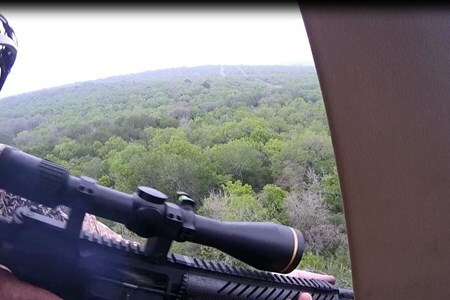 Sign up for a wild, Helicopter Hog Hunt in Texas Hill Country. 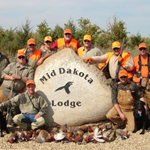 Your 3 day hunting adventure meals and lodging at a five-room, 10-person South Dakota hunting lodge. You will receive professionally guided pheasant hunting, along with trained bird ... moredogs, pheasant cleaning and processing. 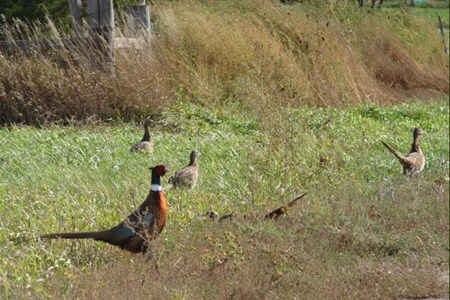 You will have the opportunity to hunt a variety of habitats ranging from CRP, shelterbelts, and different types of row crops. In addition, transportation to and from the fields is included. Though you will be provided with trained bird dogs, client dogs are more than welcome. 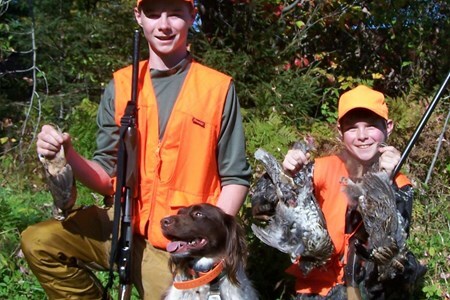 For anyone under the age of 18, all youth hunters must be accompanied by an adult. Twelve and Twenty gauge guns are most common, and you have the option of buying shells for these two sizes from us. Also, be sure to come prepared for South Dakota weather, which can vary. Hunt for Yak in the wide open spaces of Texas. 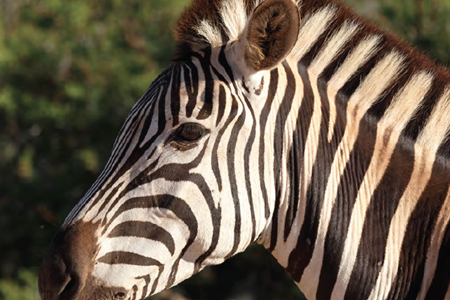 Our habitat is perfect for many types of animals that are native to different parts of the globe. You will find a unique experience tailored ... moreto your preferences with our professional guide services. 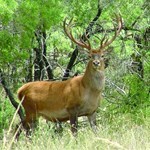 Our goal is to get you hunting, and have the most enjoyable experience possible. Additional species include Bison, Collard Peccary, Watusi, Wild Boar, and Rio Grande Turkey. 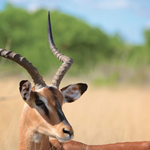 Enjoy the experience of a lifetime hunting the sable, in addition to other wild African species. 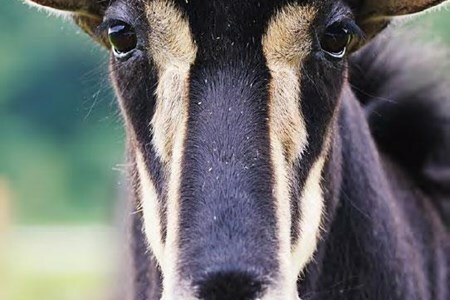 The sable is a large, rotund antelope with a long face, short neck, and dark mane. ... moreBoth males and females possess ringed horns that rise vertically and curve backward. They resemble horses when they stand straight up with their heads arched. This position also causes them to appear larger than they really are. 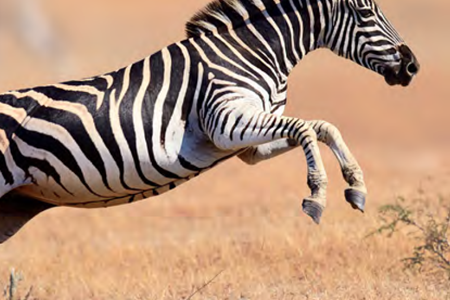 The males hold this position even when they gallop as a show of dominance. Sables change color as they grow. Calves are born reddish-brown with almost no markings. White markings appear as they grow up, and the rest of their coat gets darker. You can tell an older animal by a more striking contrast. Along with hunting a sable, your package includes trophy fees for (1) Blue Wildebeest, (1) Zebra, (1) Impala, and (1) Warthog with this package. Non-hunters will be accomodated for $150 per day. Eland are remarkably agile even though they appear large and slow. Males can grow to a shoulder height of 5.1 feet and weigh about 1900 lbs. A full-size male can jump over a normal ... moresized fence! Eland are identified by the slight hump at their shoulders and a prominent dewlap. 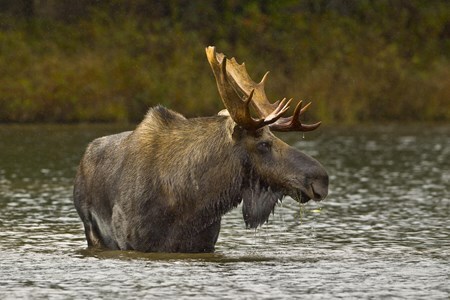 Both males and females possess heavy horns that slant backwards with lengths up to 3 feet. Females are smaller than males and typically weigh about 900 lbs. Males can be distinguished by a patch of dark hair covering their foreheads. 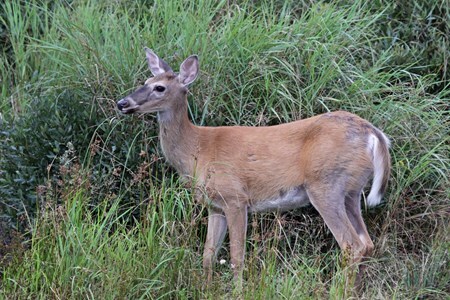 Both males and females have fawn colored coats. They also have faint vertical white stripes on their flanks, which are distinctive to the eland. Along with hunting a Eland, your Safari includes trophy fees for (1) Blue Wildebeest, (1) Zebra, (1) Impala, and (1) Warthog with this package. 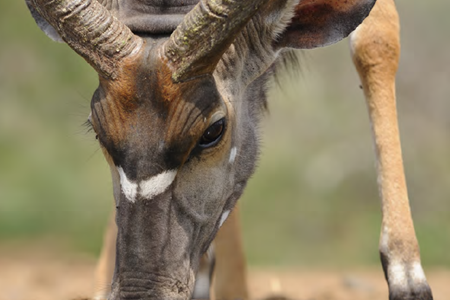 Nyala sport a brown, shaggy coat with vertical white stripes and spots on their flanks. 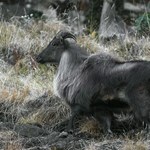 Rams are more charcoal-grey in color and possess long inward curved horns as well as a white ... morechevron face. They also have a thick black mane from neck to hind quarters. Weighing around 253 lbs. rams measure 3 ft. at the shoulders. Ewes do not have horns and are much smaller, weighing only 130 lbs. and standing 35 inches at the shoulder. Ewes are chestnut-coated and have more prominent white stripes on the flanks. The African Buffalo reaches shoulder heights of up to 4.5 ft. and can weigh close to 1650 lbs. Both males and females possess horns, and the bulls’ horns are distinguished by a heavy ... moreboss and upward curve. When a herd member is attacked, others will rush to its defense. 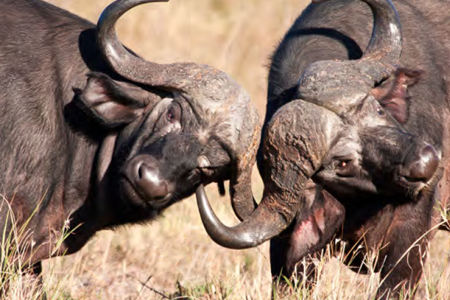 Collectively a number of buffalo can stave off an attack by an entire pride of lions. Wounded buffalo bulls are considered highly dangerous by hunters, which is one reason why it is lumped in with the ‘big five’. All Dangerous Game hunts are 1x1. Along with hunting a Cape Buffalo and Sable, your package includes trophy fees for (1) Zebra, (1) Blesbuck, (1) Impala, and (1) Warthog. Try your game at hunting an exotic bushpig, or see if you can take down a black wildebeest. Whatever you choose, you're sure to have an unforgettable experience hunting in the heart ... moreof South Africa! 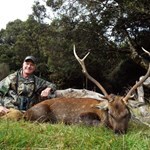 Bayete Hunting Safaris provides highly experienced guides to help you hunt on leased private land. Our large properties allow us to offer the best selection of trophies over a wide range of species. Each species we hunt has four-to-five properties, which means that game has less pressure from hunting. It gives us the option to change properties according to weather and each hunter's individual ability and skill level. The per diem rate for adult hunters is $350, and the rate for youth hunters is $50. Non-hunters will be accommodated for $150 per day. Hunt for the exotic Water Buffalo species with a professional guide. 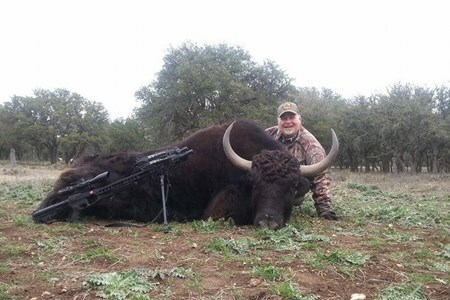 Located in Hondo, Texas, Action Outdoor Adventures offers exotic species hunting trips and can provide accomodations ... morefor extended trips. With access to private hunting lands in Texas and New Mexico, we will lead you on an amazing adventure to take down your prize. 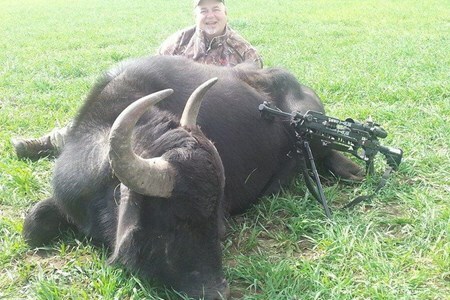 Book an exciting Water Buffalo hunt with Action Outdoor Adventures today!